Marisol's killer is brought to an end... for now. Charmed -- "Memento Mori" -- Image Number: CMD116b_0290.jpg -- Pictured (L-R): Madeleine Mantock as Macy and Virginia Williams as Charity -- Photo: Colin Bentley/The CW -- ÃÂ© 2019 The CW Network, LLC. All rights reserved. 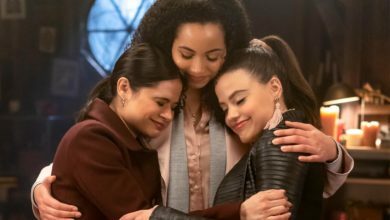 Charmed 1×16 recap: Season 1, Episode 16, “Memento Mori” Aired March 24th, 2019. We finally get a further glimpse and closure in to what happened between Marisol and Charity on the night of Marisol’s death. Here is what happened on Charmed, 1×16! We begin this episode with Charity waking up Macy, not knowing what happened after she found out that Charity was Marisol’s killer all along. Macy does not remember seeing Charity kill her mother, therefore meaning, Charity has wiped her memory in order to protect herself. Macy begins having visions of what she witnessed, but now has forgot, wondering if her demon side was manipulating her. Maggie notices burns on Macy’s arm, however she doesn’t remember how they got there and Charity covers up her story by allowing Macy to believe she has self-harmed due to her demonic traits. Later on, Macy has a dream of Bianca throwing a needle at her head in the attic, which we saw in the last episode to reveal Marisol’s killer and when she goes to search for Bianca, she finds her body and believes that she has killed her. Macy is now incredibly frightened about what she is capable of and Charity suggest binding her powers, however, Harry and the sisters go against this idea. In an attempt to figure out why she can’t remember anything, Macy goes back up to the attic and recreates the night before, putting the needle in her head, watching Bianca show her that Charity killer their mother, and that Charity was also Bianca’s death. Charity, once again, see’s that Macy has it all figured out and takes her to the vortex under the house. After Maggie and Mel have spoken to Dr. Julia, Parker’s mom, and suspect that Charity is lying to them, due to the fact that they find out that self-harm is not a demonic trait, the girls return to the house to not only find Charity missing, but also Macy. Harry, Mel and Maggie all go to the Vortex under the house, on a whim, realising that Charity warned them away from this place, meaning that she wouldn’t expect them. Macy reveals that Charity killed their mother. Mel and Maggie take on a fight with Charity, taking away her powers. After their successful defeat, Macy takes Mel and Maggie to the attic, to show them how their mother died, allowing them all to get some sort of closure. The Charmed One’s see that Marisol was in the process of unbinding their powers, when Charity walked in the room. Marisol explains to Charity that her first born had died and was brought back to life by necromancy, and also that her daughters will be the Charmed Ones. Charity begins to worry about the danger of a Charmed One being brought back to life through dark magic and pleads for Marisol to stop the spell. However, Marisol refuses to stop, therefore, forcing Charity to use her powers and throw her out of the window. Luckily for our three witches, although their mother was literally on her death bed, she finished the spell anyway just before she passed. From previous episodes, we already know Lucy is being controlled by Parker’s dad, Alastair, and we get another glimpse of this when Maggie, Parker and Lucy bump in to each other during brunch. Lucy offers to buy the couple a drink, however she pours something in to Parker’s, later on showing him pass out after having a shower. Parker confronts Maggie – whilst she cares for him – about the fact that he thinks his father has passed on a demonic virus to him, as he is the only one who can cure him. Back in the present, Fiona visits Harry and Charity, shocking the two of them. Fiona tells Charity that she is to be taken to Tartarus for her betrayal, however, whilst being taken away by two guards, Alistair kills both of them and takes Charity with him. What could the two possibly conjure up? We can’t wait to see!